Could selfies be damaging your skin? | HELLO! These days it's totally normal to whip out your phone at any given moment and snap a selfie. In fact if you don't have a photo to upload to Instagram, did it really happen? But now it's been claimed that by providing your Snapchat followers with regular updates, you could be unknowingly damaging your skin. Phones emit high energy visible [HEV] light from the screens, which, over time, is believed to have a negative impact on skin pigmentation and pores. Dr Justine Hextall, for The Harley Medical Group, told us: "There seems to be emerging evidence that light from cell phones and computer screens, which is referred to as high energy visible light [HEV wavelength of 4-500 NM], can in fact penetrate into the deeper levels of the skin. "This results in free radical damage that is upregulating an enzyme MMP-1. This enzyme breaks down skin collagen and elastin, the structures that keep the skin firm and youthful." Some studies have even shown that HEV light may be more damaging to skin that rays from the sun, and increased exposure to the blue light from phones, tablets and computers can accelerate aging and eventually stop the skin from healing. 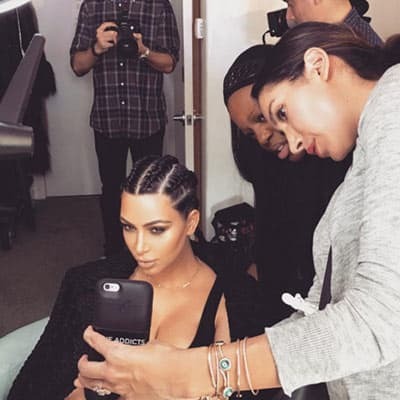 Which is bad news for celebrities such as the Kardashians, who are famous for their love of selfies. Kim, 34, has such a passion for self-portraits that she released a book dedicated to them in 2015. And using your phone or tablet outside could mean even more bad news for photo lovers, as reflections from the screens could increase exposure to UVB and UVA lights. Because of the rise in popularity of both phones and tablets and the way we are using them, it is now recommended that sun protection is used at all times.